Police violence erupted in savage repression against the students during the evening of Friday, May 3: 596 arrests, hundreds of injured. 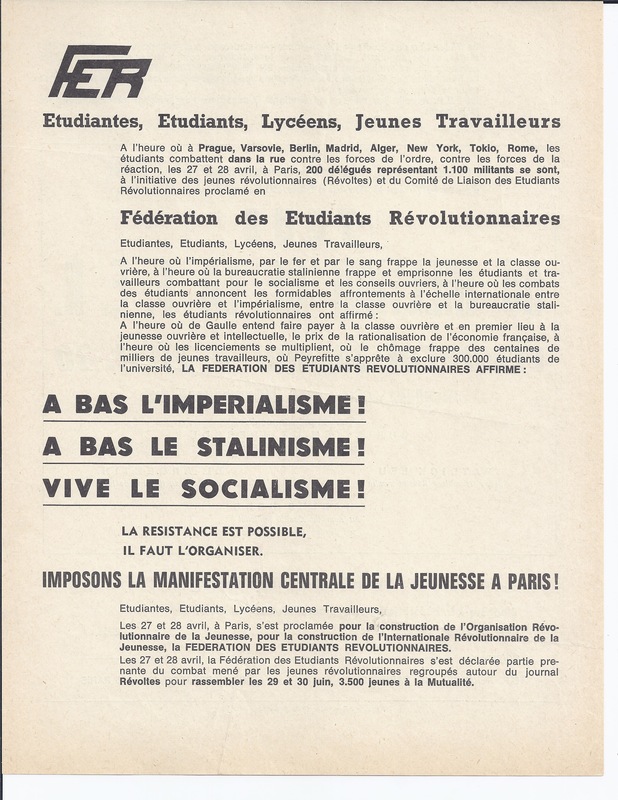 Like the workers at Caen and elsewhere, students, passersby, even high-school students were victims of fierce repression. In effect, their struggle is fundamentally the same: workers reject the society that exploits them, students reject a University that tends to make them the docile leaders of a system founded upon exploitation, sometimes even the direct accomplices of this exploitation. The reactionary press aims at presenting the student movement as a revolt of privileged youth and seeks to cut us off from our natural allies. The bourgeoisie knows that it is with the workers and only with them that the students can win. Against this wall of lies the students must make known to the public the motives of their struggle. 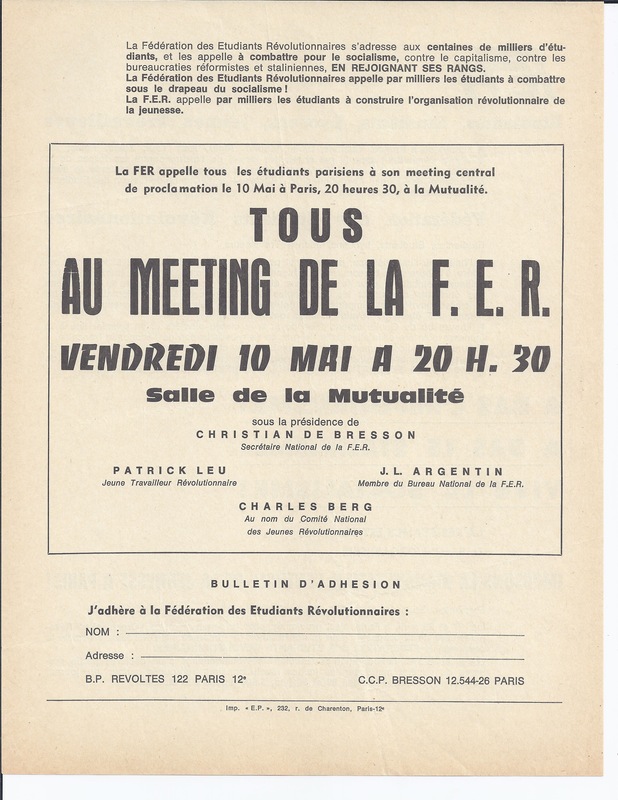 THE UNEF PROPOSES THAT THE UNIONS OF TEACHERS AND WORKERS RETURN TO THE UNIFYING PROCESS WHICH ACTUALLY FUNCTIONED DURING THE DEMONSTRATION : WORKERS, HIGH-SCHOOL AND UNIVERSITY STUDENTS HAVE SPONTANEOUSLY RESPONDED WITH THE U.N.E.F. TO POLICE AGGRESSION. 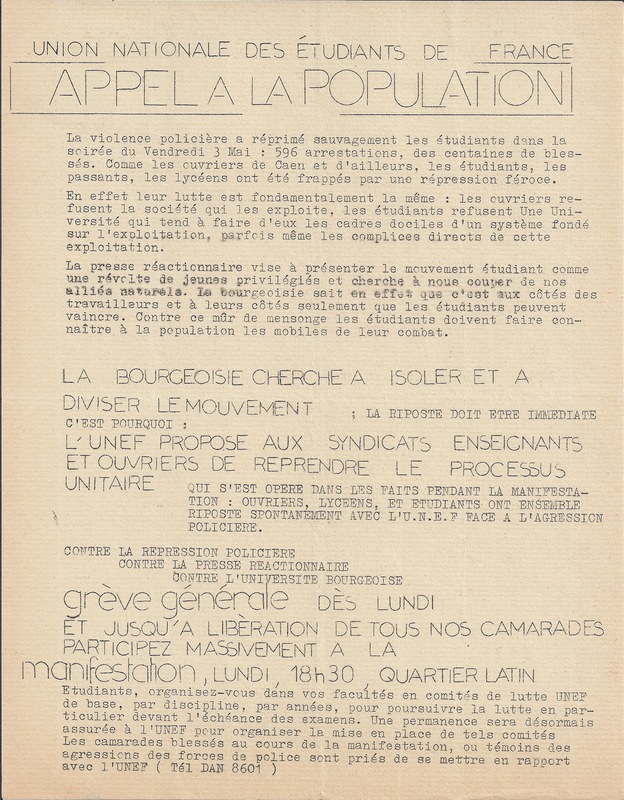 GENERAL STRIKE FROM MONDAY ON, AND UNTIL THE LIBERATION OF ALL OUR COMRADES, EVERYBODY PARTICIPATE IN THE DEMONSTRATION IN THE LATIN QUARTER ON MONDAY AT 6:30 P.M.